September 1 marks the official start of the annual Taiji dolphin and small whale hunt in Japan, made infamous by the 2009 documentary The Cove. A quota of nearly 2,000 animals has been approved for this season, and Taiji hunters insist that the killing is done in a humane fashion – but the method used involves tethering the animals’ tails then severing the spinal cord of each animal in turn using a metal spike. The metal spike is meant to cause immediate brain death, followed by ‘bleed out,’ but video footage captured over recent years shows animals clearly in severe distress and struggling for their lives. (A 2011 veterinary observation noted one death took four minutes.) Cetaceans are intelligent and closely bonded creatures with complex communication systems – which means the process is anything but humane for the animals still struggling to free themselves as the water fills with the blood of their already slain fellow pod members. This year bad weather delayed the start of the slaughter, but the hunt lasts until the end of February for dolphins and the end of April for whales, so it’s only a short reprieve. Pods of dolphins and small whales are captured in Taiji’s cove using the drive hunting technique – and some of them are forced inshore from as far away as 30 kilometers off the coast. Pods are netted in overnight in an attempt to calm the distressed animals down. Hunters then pick out animals in good condition for sale and transport them to aquariums and dolphin shows in Japan and overseas, while hundreds of others who have scarring or other marks are slaughtered for meat. It’s questionable whether the animals saved for aquariums meet a better fate. Many die of shock after capture or during transportation, and increased aggression and depression in captive animals is observed, as well as a significantly reduced life expectancy. News reports indicate that at least 50 protesters are already on-site in the cove to campaign against the 2014–2015 hunting season, with a large police presence also on hand to keep the peace. 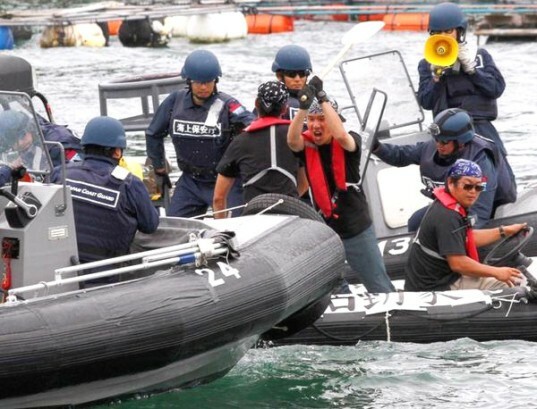 Japanese Coast Guard members have also been conducting drills on subduing protesters in preparation for the season. Taiji fishermen argue that the annual hunt is traditional and, basically, nobody else’s business. While dolphin and whale hunting from the town has a history dating back around 400 years, the current drive hunting method has only been in use since 1969. The sale of dolphins to aquariums is a significant source of income for the community, but the high concentration of mercury found in dolphin meat makes it unsafe to eat and Japanese consumers haven’t responded well to Taiji’s efforts to repopularize it. If you would like to add your voice to the protest against the Taiji hunting season, there are a number of organizations campaigning to end the slaughter who could really do with your help right now, including Sea Shepherd and Save Japan Dolphins. This makes me feel bad about Japan, I thought they were educated rich country but still they are barbaric country doing foolish, embicile and crazy stuff. HATE that! This makes me feel sick. I\'m embarrassed to be a human. Absolutely disgusting. Surely we are better than this! Bunch of freakin , filthy , demonic , ............poor excuses of human beings. You wanna hunt , do it on the open seas. This is cowardly !!! I simply have no words and normally we would insult a person by calling them an animal or similar. Even animals have a heart !!! You slimes , vermin , do not.....Go hunt on the open seas and get your dues , or ............are you guys scared ???? Certainly nothing says "humane" more than killing a panicked-out-of-it's-mind creature as it is choking on the blood of it's neighbors and family. Just another reminder that ignorance... er, I mean "traditions" die hard. September 1 marks the official start of the annual Taiji dolphin and small whale hunt in Japan, made so infamous by the 2009 documentary The Cove. This year, bad weather delayed the start of the hunt, but given that the slaughter continues until the end of February for dolphins and the end of April for whales, it has only bought a short reprieve. News reports indicate that at least 50 protesters are already on-site in the cove to campaign against the 2014–2015 hunting season, with a large police presence also on hand to keep the peace. Japanese Coast Guard members have also been conducting drills on subduing protesters in preparation for the season (pictured). Tensions are reportedly already running high. 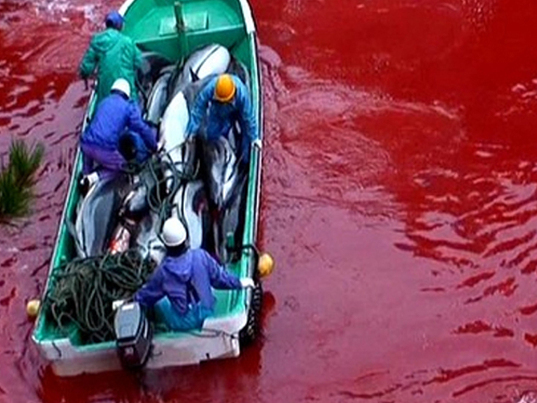 Taiji fishermen argue that the annual hunt is traditional and, basically, nobody else’s business. While dolphin and whale hunting from the town has a history dating back around 400 years, the current drive hunting method has only been in use since 1969. Taiji hunters insist that the killing is done in a humane fashion, but the method used involves tethering the animals’ tails then severing the spinal cord of each animal in turn using a metal spike. The metal spike is meant to cause immediate brain death, followed by ‘bleed out,’ but video footage captured over recent years shows animals clearly in severe distress and struggling for their lives. A 2011 veterinary observation noted one death took four minutes. That cetaceans are such intelligent and closely bonded creatures with complex communication systems also means the process is anything but humane for the animals still struggling to free themselves as the water fills with the blood of their already slain fellow pod members.